Our LIDS Aircrew System was recently used during a five-day exercise testing Chemical, Biological, Radiological and Nuclear capabilities in an attempt to validate AFE response teams. Air Mobility Command (AMC) used our LIDS CBRNE Supreme Aircrew Decontamination System during Exercise Toxic Arch. More than 15 Aircrew Flight Equipment technicians gathered to train on Aircrew Contamination Control Area (ACCA) processes and procedures using our LIDS system. Our LIDS CBRNE Supreme Aircrew Decontamination System was used during a Readiness Inspection at Yokota Air Base, Japan. During the Samurai Readiness Inspection Airmen from the 36th Airlift Sq. and the 374th Operations Support Sq. performed aircrew decontamination procedures using our LIDS system. You can view the photos and details by clicking the above link. Our LIDS CBRNE Supreme Aircrew Decontamination System was recently used by the 3rd Battalion, 4th Air Defense Artillery to conduct training in southwest Asia. 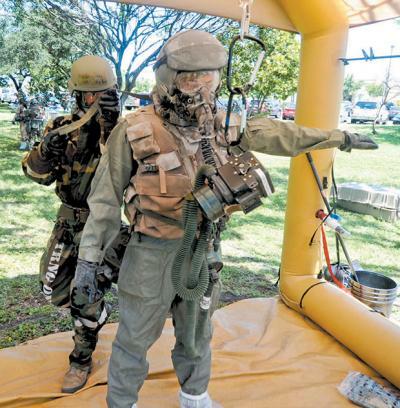 Our Chemical, Biological, Radiological, Nuclear, and Explosive, (CBRNE) Lightweight, Inflatable, Decontamination, System’s (LIDS) has been a part of CBRNE WMD decontamination infrastructure of the United States military, for the past 15 years.